I’ve been a comic book fan for quite a while. I’ll read a whole series of trade paper backs by one writer on one character at a time. My ongoing adventure is with the writer Greg Pak and the Hulk. To the new reader, or to those following his cinematic interpretation in the Marvel movies, The Hulk might seem like a very simple character. His origin story is such- Because of an accident involving gamma radiation(classic!) Bruce Banner now turns into the Incredible Hulk whenever he gets angry- a big green muscular monster with a limited vocabulary. He likes to smash bad guys, but also the occasional building or two. 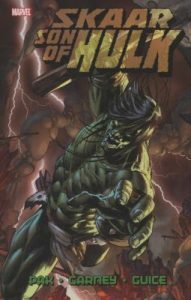 Before Greg Pak’s run, Peter David wrote hulk comics for twenty years. He successfully made Bruce Banner and his alter ego into a complex and tragic character. He centered much of it on Bruce Banner having an abusive father. The trauma from this childhood has deep psychological affects on Bruce, and as it turns out, this trauma is the reason why the gamma accident had such a unique affect on Banner. When Greg Pak begins his run, he creates a whole new mythology by sending the Hulk into space. Hulk lands up on the alien planet Sakaar, a planet with its own host of intergalactic problems and people. Pak then brings Hulk and his new ‘warbound’ buddies back to earth. 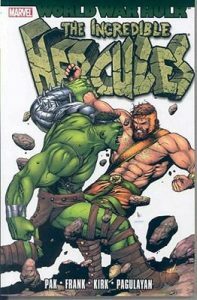 He merges his new Hulk mythology with everything that Peter Davids established, and builds on it to take the story forward. Pak’s entire run on the Hulk is fun and is a well balanced comic book epic. There is plenty of smashing (as there should be,) and a lot of character development and compelling ideas that come up. Some of the most fun story telling comes from utilizing multiple characters Super human intelligence. My favorite character is Amadeus Cho, the supposed ‘7th smartest person in the world,’ who can calculate how to bring down a tank with a well placed pebble. And then there is the conniving ‘puny’ Banner himself, who at times is downright diabolical in manipulating events towards his own ends. I would start with Work War Hulk where Hulk returns from space angry as ever, and then follow the chronology of hulk related Greg Pak stories from there. Librarians will be happy to help you figure out the reading order as we do have several books in the series. Some of these stories are Hulk stories without the Hulk. These tales round out the stories happening around Bruce Banner, and introduce readers to characters who are just as interesting. 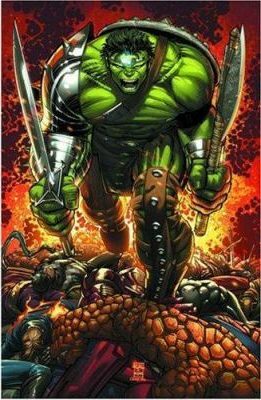 One new character worth mentioning is Skaar, the hulk’s half-alien son who grows up with his own set of trauma birthed anger issues. As they are comic books and are well paced, this set of graphic novels are really fast reads. That is if you’re not gawking at the wonderful artist interpretations of alien planets and creatures, science fiction labs, and explosions galore. There is quirk, action, drama, heart, and some very good plotting. If you’re not already a superhero fan, you might just realize what the current craze is all about.